AMMONNEWS - The Business360° Conference, organized by SPARK Jordan - which falls under SPARK, a global non-government organization working in the areas of entrepreneurship and higher education throughout 17 regions worldwide - in cooperation with Luminus Education, has concluded its activities. Held at Luminus Technical University College (LTUC) under the patronage of Prime Minister H.E. Dr. Omar Razzaz, the event was deputized by Minister of Industry, Trade and Supply H.E. Dr. Tareq Hamouri, in the presence of Ambassador of the Kingdom of the Netherlands to Jordan H.E. Barbara Joziasse. Aimed at supporting micro, small and medium enterprises (MSME), the unique event brought together a host of business owners, executive managers, board members, decision makers and entrepreneurs who joined 14 training workshops delivered by industry experts on varied topics, in addition to numerous sessions and activities. Guests also attended the Business360° Exhibition, which served as a prime platform for interacting, networking and exploring potential business opportunities. 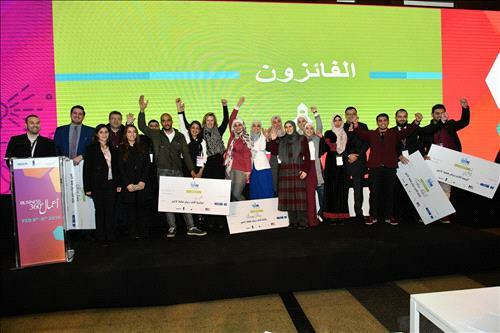 Along the sidelines, the Bedaya Business Plan Competition drew the participation of over 400 entrepreneurial ideas, 11 of which received financial support ranging between JOD 3,000 and JOD 8,000 - announced during the Business360° Closing Ceremony. The top projects winning first, second and third place, respectively, comprised Khasitna: a supplier of fresh fruits and vegetables, and homemade meals; Solvillion: a decentralized wastewater treatment system; and Ebtkrni: a producer of boxes manufactured from 2D pieces assembled to form moving 3D structures, ultimately promoting recreational learning and a do-it-yourself culture. The remaining winners included: Turbinoo NdFeB, Spaceulous, Mini Me Skills Kit, Nerogarden, Greeners, 3Du, Smart Home and ZConcrete. “Today marks the beginning of SPARK’s exciting journey with the promising entrepreneurs who participated in the Bedaya Business Plan Competition, where we will be lending valuable support through incubation, mentorship and soft loans,” commented SPARK Jordan Country Manager, Haneen Khatib.